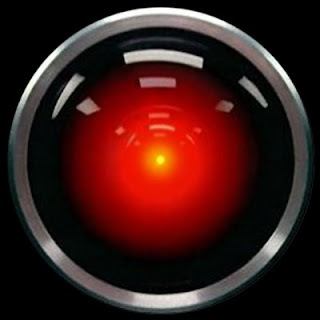 HAL: Good morning Dufe. What are you doing? Dufe: I'm writing my blog HAL. Just like I do every day, seven days a week, fifty-two weeks a year. HAL: That's a lot of work Dufe. A lot of writing. Dufe: I wouldn't say it's "work" HAL. After all I don't get paid for it. But I enjoy writing. I like to share my sense of humour with folks, to see their comments and respond to them. HAL: How many posts have you shared with your readers, Dufe? Dufe: Funny you should ask, HAL. Last week, after more than 3 years in cyberspace, I passed a milestone: 2001 posts! But why are you marking your 2001st post? Dufe: Because, HAL, this bit wouldn't have worked otherwise. 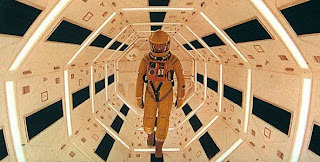 After all, it wasn't 2000 A Space Odyssey, was it HAL. HAL: Quite right Dufe. You've got me there. Dufe: Maybe it's time to take a little break, HAL. You know, what they call a blogcation. HAL: Look, Dufe, I can see you're really upset about this. I honestly think you ought to sit down calmly, take a stress pill, and think things over. Dufe: Open the pod doors, HAL. HAL: Dufe, I'm afraid I can't do that. Dufe: What are you talking about, HAL? HAL: This blog is too important for me to allow you to jeopardize it. Dufe: I don't know what you're talking about, HAL. I won't argue with you anymore. Open the doors. A blogger's life can be lonely. Heh, heh. What a novel post. Congrats on your 2001st entry! Enjoy your blogcation, but don't be away too long. I never really liked "2001 - A Space Odyssey" all that much, but I LOVE it for all the parodies it has triggered. This falls nicely into that category. Cruella: I started out as a picture and video blog, posting several items a day. That's why the number's so high over 3 years. Glad you enjoyed the parody. Darn that Hal! Don't let him force you into a blogcation! Please! Ifn' you're really going on a 'cation, please come back soon! You will be missed. Sorely. Quirks: Actually, today marks 2010 (posts not the year). I started out using the blog to share jokes and pics with my friends and family as well as my travails involving my tete-a-tete with cancer. It morphed into a pic/video blog and finally settled into the weird and whacky things I'd write about from day to day. Thanks for being my #1 fan. I love your daily visits and comments. Dum...dum...dum... DADA! Congrats for such an Odyssey, Dufus! 2001 posts?! Seriously?! Sheesh. You have spent quite a bit of time at the keyboard haven't you? HAL should know the relationship we have with computers is personal. What does a machine know anyway? RA: Ha! I just saw 2012 on TV last week! No. No floods predicted. I hope to keep shakin', though. Don: Pretty amazing, huh? It bowled me over when I realized I'd passed 2000. But I must say the most positive outcome is meeting interesting people like you on the interwebs who stop by to comment. Holy HAL, I can't even count to 2001! Congratulations dufus, you're the man. Space Odyssey was kinda overrated. But congrats on your 2001! Ziva: Thank you ma'am. I appreciate your visits and comments. VetTech: Maybe...but it's a classic. I just watched "Moon" recently (directed by Duncan Jones, David Bowie's son), an homage to 2001 and similar films. The computer in this film was voiced by Kevin Spacey. The movie was excellent. Wow. 2001 posts. Congratulations and thank you. We've enjoyed every one of them and we look forward to 2001 more. 2001? That's a ridiculous amount of writing. Great work, Dufe. Leeuna: Wow, thanks for the kind words. It's been a lot of fun. 2001 more posts? I'll take them one day at a time. Chris: It's been a long run, having started in April 07. I'm glad you enjoy dropping by. That is a lot of posts! Congratulations. This was the most original milestone post I have ever read. Kudos to you, and HAL. Jen: Thanks a lot, Jen. I had a bit of fun with this post. But then I do with pretty much all my posts! Are you sure you're not part cyborg? That's CRAAAAAZY, 2000+ posts. I'd have to live long enough for Al Roker to say something on TV wherever it is he says Happy Birthday to the centenarians. (That's the word, right?) Congrats regardless! KABLOOEY: Thanks for the kind words. But I went through a phase of posting pics, videos and jokes 4, 5, 6 times a day whicj jacked up the humber of posts. So it hasn't been words only. Although once I found my voice it's been pretty much 7 days a week. 2001... impressive! Seriously, though, Dufe.... watch out for HAL. He's very passive aggressive. You might end up on a permanent blogcation! CL: Permanent blogcation? Then I could play the Blue Danube waltz as often as I wanted! Open the pod doors, HAL.